Virtual Assistants. You’re kinda like heroes of the online world, if you think about it. While your clients are out there, killing it in whatever industry they’ve chosen to delve their time and finances into, you’re behind the scenes. Handling all the administrative details. Keeping up on all the odds and ends. Basically, holding everything together. The more efficient you are, the more efficient they are. When you succeed at what you do, you’re helping them succeed at what they do. But every hero needs a secret weapon. You know, for that little touch of rocket fuel to take him or her from hero to SUPERhero. Do you want to be a hero virtual assistant…or a SVA, a superhero virtual assistant? If your answer’s what I think it is, perhaps it’s time to start thinking about social media automation. By putting your daily duties on autopilot you’ll be saving yourself mass quantities of time and energy that you can then reinvest in yourself and your own business. To become better. Super, really. So what could investing in a social media automation tool like Bulkly do for your VA business? It’s totally up to you. But here’s seven suggestions to get you started. When you automate the posts going out on your clients’ social channels, your active duties are cut down significantly and you’ve got some newfound extra time on your hands. So what does one who wants to grow one’s business and get ahead do with extra time and an easily managed list of clients? By becoming more efficient at what you currently do, you can do more in less time. So taking on a few more people and automating their accounts as well will allow you to successfully manage a collection of clients and accounts that you could never have conceivably managed…without the right social media automation tool. When you’ve got your dailies under control and you’re looking to further your name in the social media community and dig up some additional clients, you’ve got to go kissing some babies. I’m not saying you need to become a politician anytime soon. But it’s time to step out from behind that computer screen and start shaking some hands in the online community. Sign up for an upcoming digital or social media conference. Get involved in your city’s marketing association. Seek out local networking events. Get some business cards made up. And go. Get out there. By networking, you can get fresh ideas from brilliant minds in your industry, market yourself and your services to potential clients or even meet interesting people you may want to collaborate with on future business opportunities. Anything is possible. But you’ll never know until you get out there and see what the social community has to offer. In the flesh. Everything gets outdated after a while. What’s new today is old tomorrow. Especially in the social media community. And in order to nab the most successful clients and really ramp up your presence in the VA arena, you’ve got to keep up with the times. And broaden your skills and experience. Much of what goes on in the social media community is featured online. Go figure. Social media tools like Bulkly, SproutSocial, Hootsuite and even general platforms themselves like Twitter and Facebook, have active blogs and message boards featuring recent news and updates. Take the time you’ve saved by automating your clients’ social media channels and reinvest it into skimming these blogs for pertinent articles at least twice a week and, if possible, check in on social news updates on a daily basis. Not only will you be adding to your own knowledge base to be able to do what you do better, but you’ll also be able to impress your current and potential clients with conversation topics centered on the newest social trends and tricks of the trade. Looking to master a completely new skill instead? Maybe you’ve always had the desire to dabble in graphic design. Or photography. Or maybe you need to sharpen up your copywriting skills. In today’s world, training or even achieving a degree in any of these areas can be achieved online. At a much cheaper price than a traditional degree. Obtain a membership on a training website like Lynda.com where you can take courses on design and writing at your leisure. Watch YouTube videos on how to frame a spectacular photo. Or go big and enroll in a degree program with an accredited online university. With more time saved through social media automation, the possibilities are endless. And affordable. Not really ready to take on an online degree or not sure what new skills you’re realty set on learning? Maybe you could start using the time to explore what you’ve already got. You can offer your clients even more services by digging into your creative side. For instance, try dreaming up a new social campaign for one of your current clients, unasked. What kinds of images and copy would help make his accounts sparkle? Or perhaps one of your clients has been talking about potentially starting a blog for her online business. What if you come up with a smart wireframe for how she can build out her web pages or perhaps you can start writing a few clever posts to get her started. By showing that you think outside the box and go above and beyond to deliver on future and potential needs in a creative way, you’re making yourself indispensable to your clients. So they’ll give you more responsibilities. And hold on to you for the long term. And tell their friends about what an awesome VA you are. Job security and referrals are some pretty sweet benefits of social media automation, no? Everyone makes mistakes. Even heroes. But SUPERheroes? If you want to be really super, you’ve got to make sure that errors are a complete and utter rarity that graces your work so infrequently that when it happens, everyone (including yourself) is so shocked, they’re forced to blame it on themselves. Or on a change in the Earth’s polarity. Because when you build out your CSV file full of bulk posts, you have the ability to give them a second look or even run them through spell check and make little tweaks here and there before uploading them for posting. And when they’re running over and over, you’re minimizing the chances of your making an error in those new posts as well. 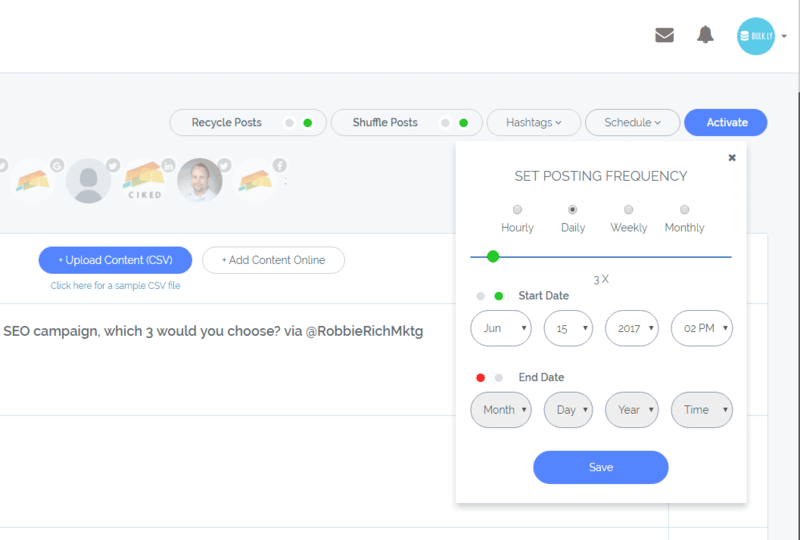 You can even use the social media automation tool you’ve already invested in to automate your daily posts to run a social campaign. And reduce your error rate there too. For example, if you’re using Bulkly, you’d just create a separate CSV file full of only the posts you want to feature for that particular campaign. Just fill out the CSV download form available on the site with the content you want featured for your campaign the way you normally would. But this time, include a group name in column A that’s different than the rest of your uploaded content. This will create an entirely separate stream of posts to be mixed in with your regular feed. Then you just upload the form and set the posting schedule. Again, before you upload your campaign into your social tool for automated posting, you’ll have the ability to spell check and re-evaluate your content in the CSV form. And once your posts are uploaded, you’ll have a schedule set for when they’ll go out. So you won’t forget a critical post. Not that you ever do. But having a handy tool to have your back on your potential mistake-making days can really solidify your reputation as a superhero VA. Even though you’re well on your way to superhero VA status, you’re not quite a man or woman of steel. And now that you’ve got your clients’ social channels automated and running with less errors on a flawless schedule…maybe it’s time to sharpen your skills in a totally separate arena. Having the relief of less mistakes in your posts and less concern about when you need to remember to post them can help you clear your head and de-stress a little. Setting things on autopilot might even afford you the opportunity to check out for a while. You don’t have to take a sabbatical and disappear for a month. You might just want to head to the beach for the weekend, or heck – take a random day off in the middle of the week to sleep in, go for a walk and have a nice dinner out. Taking the time to de-program and get out of your normal schedule and regular social duties might just be the mental break you need to boost your creativity or build up your bravado to get out there and make networking a new priority. Turn off your phone. Close out your dashboard. Shut down your laptop. Because when the accounts you manage are automated, you can rest assured you’re covered. Even while you’re out of office. Obviously, in order to be good at what you do, you’ve got to be up to speed on your past social media success rate via research and analytics. But there’s only so much time to be staring into the rear view mirror when you’re charging full speed ahead. I.e. constantly posting to your clients’ channels and coming up with content on the spot doesn’t give you a lot of time to be retrospective. Or intellectually curious. But once the dailies are running for you, you can spend more time looking into the things you’re doing right and what’s afforded you and your clients the greatest rate of success. And of course, you can also take greater note of the things you’re not doing so well. And improve them. Or do less of them. Or even use them as your inspiration to sign up for that online course you’ve been on the fence about. And don’t just stop where your social influence ends. Look into other successful social accounts and brands. What do they do well? What campaigns were major successes? Major flops? How did their content hit the mark? Or miss it completely? Seeing what other people do well (and do poorly) can help you more accurately hone in on your own strengths and weaknesses and even give you fresh ideas for how to manage your clients’ channels. Social media automation can help you find more time to do that. As you have read, there are many benefits of automating some of your social media efforts. At this point, you might be wondering how to do this. It’s actually pretty easy, especially when it comes to scheduling social media updates. More than likely, you have probably heard of the social media scheduling tool Buffer. If you aren’t familiar with it, Buffer allows you to schedule social media updates across a variety of social media channels. Most notably Facebook, Google+, LinkedIn, and Twitter. The time consuming part of this process is actually adding the social media updates. You can automate the adding of social media updates to Buffer by using Bulkly. I sort of touched on this in point #5 above, but wanted to show you a real example of how you can do this. Want to automate the scheduling of social media updates for your clients? Be the first to know when Bulkly is ready Click here to be notified. Bulkly gives you a variety of ways to automatically add content to your Buffer queue. This can be done by uploading a spreadsheet of updates, sourcing RSS feeds to curate content, or by having content automatically pulled from RSS feeds. And best of all, once it is setup – you can AUTOMATICALLY recycle all of your social media updates. Let’s take a look at one way you can automate your client updates with social media automation. Using Bulkly’s “Content Upload” feature, you can import hundreds of social media updates that can be dripped into your clients Buffer queue. Once you are logged into Bulkly, from your dashboard click on the “Content Upload” option. From here you will want to click the link to download the template file and open it up in Microsoft Excel. Column A – This is for your “group name” which allows you to organize your social media updates into different groups. You’ll need to build out your spreadsheet. I’ve covered a few ways you can find social media content if you need some ideas. Or you can try your hand at creating evergreen social media updates. Then head on over to your dashboard in Bulkly and click on the “Content Curation” option. 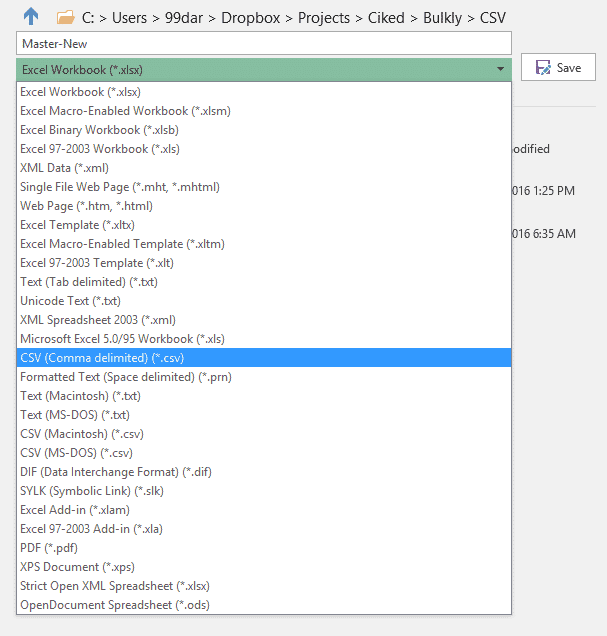 Then click on the “Upload Content CSV” button and select the CSV file you just created. Within a few seconds all of your data from your CSV will be added into Bulkly. Within this page you can make edits to your updates or delete any you decide you don’t want to use. Then all you have to do is tell Bulkly how often and what accounts to add these social media updates to. In this example, I want to send these posts 3 times a day randomly (shuffle posts) and repeat the process everyday (recycle posts). This means that Bulkly will do this again and again for you everyday. Without any extra effort or time from you. Click the “Activate” button and that’s it. Moving forward Bulkly will automatically add 3 updates a day from this group. Of course you can post as much (or as little) as you want. You are in control. Most importantly, you’ll free up hours of your time every week and your clients will be thrilled to know that you have been “hard at work” keeping their social media profiles active with great content. You’ve got a lot of plates spinning at once. I hear you. I only manage my own accounts and before I invested in social media automation, at times I could hardly find the time to keep up with my daily posts, let alone really dig into research, network, engage with my followers – or even work on building out new and helpful social tools like Bulkly. …remember that choosing to invest in social media automation could be the answer you’ve been looking for. To take your business to the next level. To upgrade your arsenal of digital skills. To make you the superhero VA that you’ve always wanted to be. So what are you waiting for? Get signed up with a social media automation tool like Bulkly today.